It's officially my favourite time of the year - Halloween season! When I was young, I wasn't too fussed on Halloween, but now that I'm older, I just want to get involved with all things spooky. Doing the Halloween shift in the university bar is my favourite because I get to dress up and see all the other costumes whilst getting paid for it. It's a win-win! 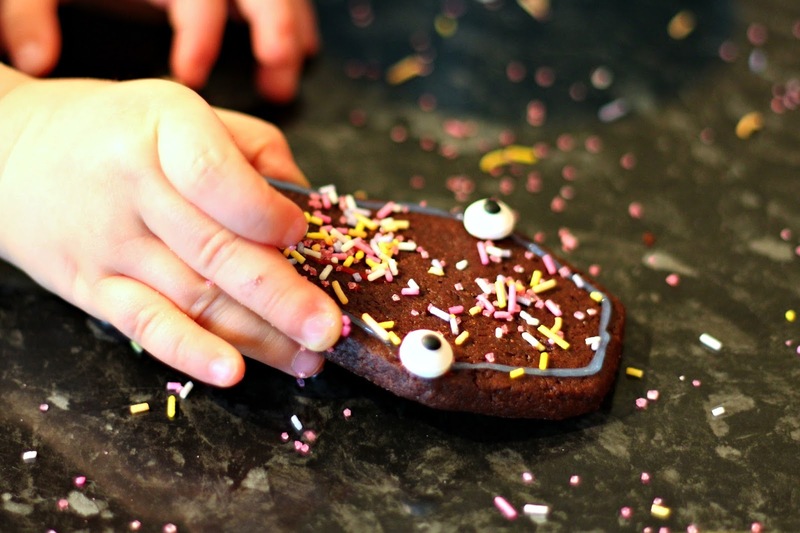 But the best thing about Halloween for me is all the fun and creative baking ideas. Last year, I did three different bakes for this season and I did them quite late into October, but this year, I'm kicking it off early with these chocolate sugar spookies! Something else that is slightly different from last year's Halloween bakes is that for this one, I had my little friend help me out. I really wanted to do something that was kid-friendly for all of my readers that have children to entertain at this time of the year, so I decided to test this bake out on my goddaughter. She's two and a half years old with the attention span of a chimpanzee, so keeping her focused on one task can be quite the challenge. 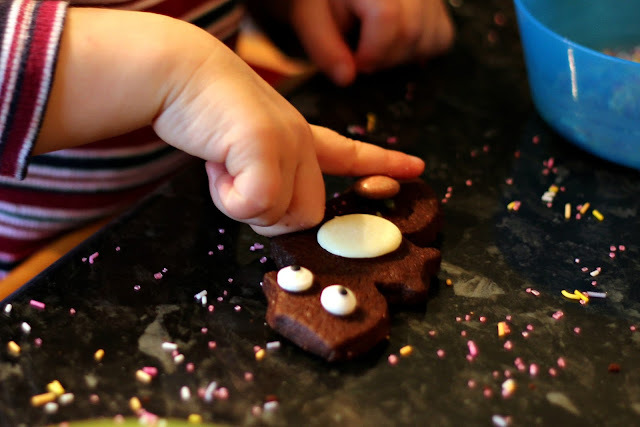 You'll be very pleased to know, though, that she absolutely loved making these little biscuits and was actually a bit upset when I said that there were no more for her to decorate, so if you've got an energetic child to entertain, these may just be the answer! So what exactly are chocolate sugar spookies? Well, I'm glad you asked. On a trip to America years ago, my sister and I discovered the most amazing, cakey biscuits that we later found out were called sugar cookies. We have nothing quite like them in the UK, which is absolutely heart-breaking, so if I'm ever in America, I always try to find them in the supermarket. Me being a bit of a baking nerd decided to do some research into sugar cookies and found that the dough is really great at keeping its shape while baking. Because I don't have a fan oven, biscuits spreading is a bit of an issue for me, so I knew that sugar cookies may be the answer. What makes them even better is that they're soft biscuits and not crunchy or hard, so they're ideal for little ones that may fancy a treat. 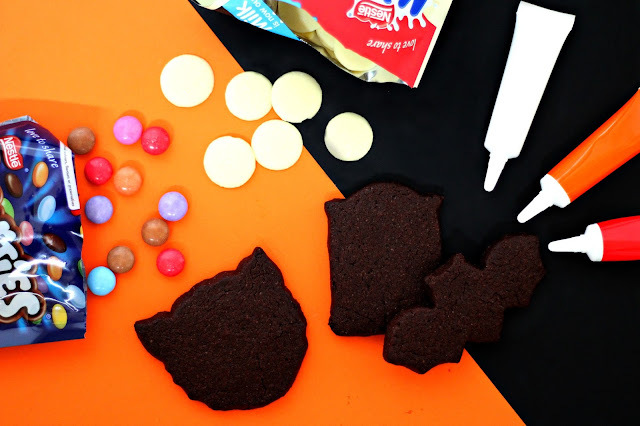 I figured that sugar cookies would be perfect for my first Halloween bake and if I threw in some cocoa powder, they'd be all dark and spooky, which helped me land the name - chocolate sugar spookies (instead of cookies, ya get it?). I bought six cookie cutters from Homesense and I was away! We had coffins, skulls, cats, bats and gravestones in no time (I didn't use the vampire teeth cutter). 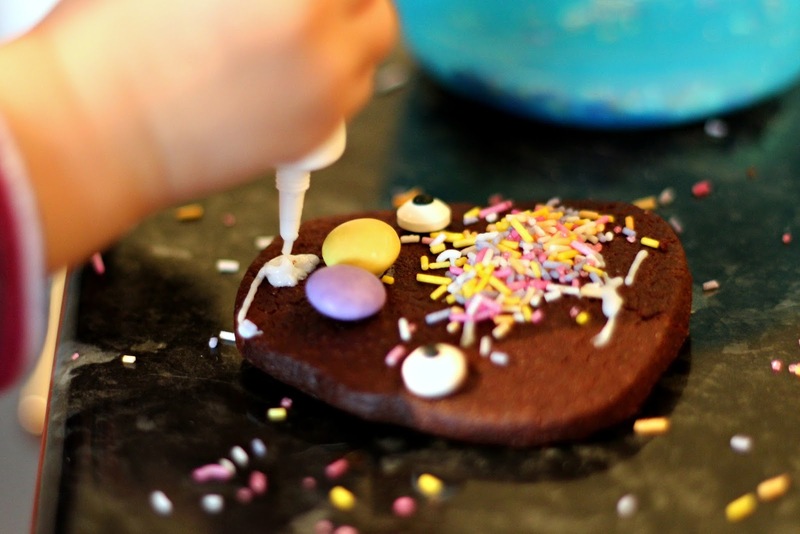 What I will say is that the dough for the biscuits has to chill for an hour to help reduce any spreading and to make cutting out shapes easier, so you may need a little something else to keep your kids occupied whilst it's chilling. 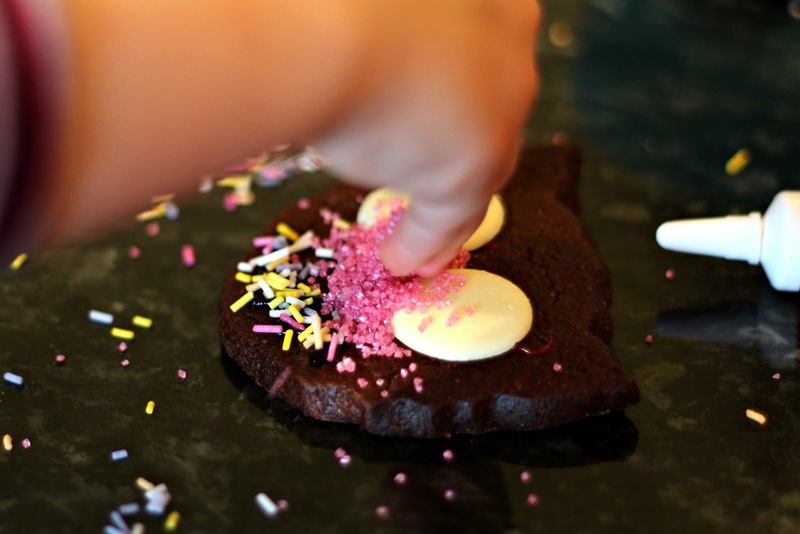 Or you could always make the cookies beforehand and just let your children go crazy with the decorations. That would be the perfect idea for a Halloween party! In a large bowl, beat the butter until completely smooth and creamy. Add the granulated sugar and beat until light and fluffy. Beat in the egg and vanilla extract. Be sure to scrape down the sides and bottom of the bowl as needed. Sift the flour and cocoa powder together in a medium bowl. Whisk in the baking powder and salt until combined. Slowly mix into the wet ingredients until combined. Divide the dough into 2 equal pieces. Roll each portion out onto a piece of greaseproof paper until they're just under a centimetre thick. 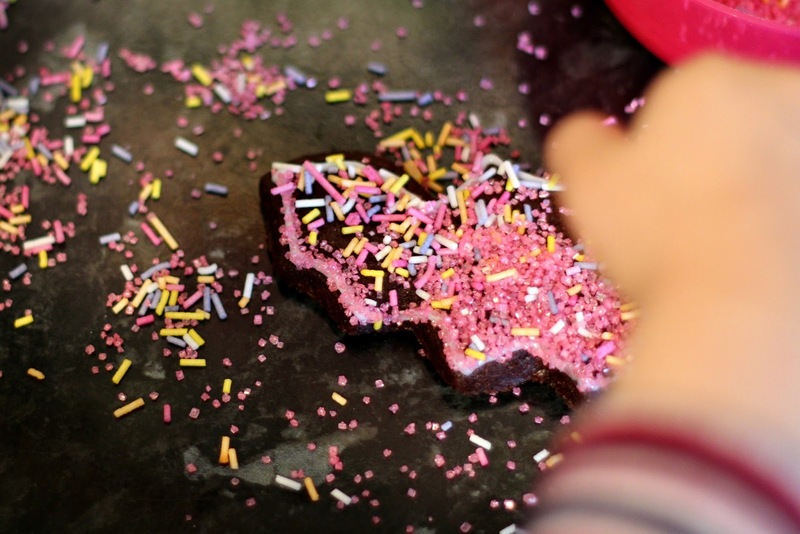 Stack the pieces (with greaseproof paper between) on to a baking sheet and pop into the fridge for at least 1 hour. You must chill this dough, otherwise you could end up with some blobby shapes. Once chilled, preheat your oven to 180c and line 2-3 large baking sheets with greaseproof paper. Remove one of the dough pieces from the refrigerator and using a cookie cutter, cut out your shapes. Transfer the cut cookie dough to the prepared baking sheet. Re-roll the remaining dough and continue cutting until all is used. Bake for 10 minutes, but make sure you rotate the baking sheet halfway through. The cookies will still appear soft, but allow to cool on baking sheet for 5 minutes, then transfer to a wire rack to cool completely. 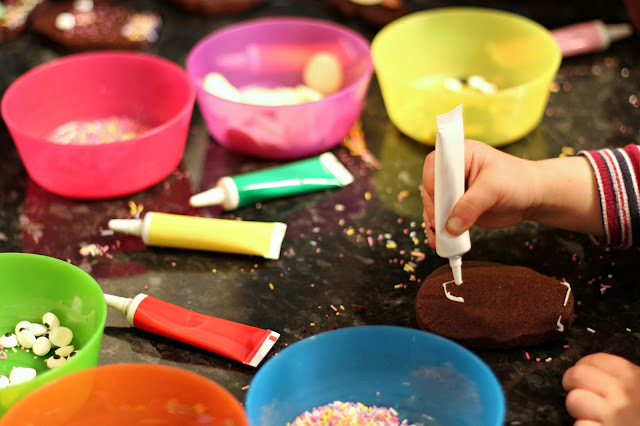 Once all of your cookies have been baked and have fully cooled, you can get decorating! 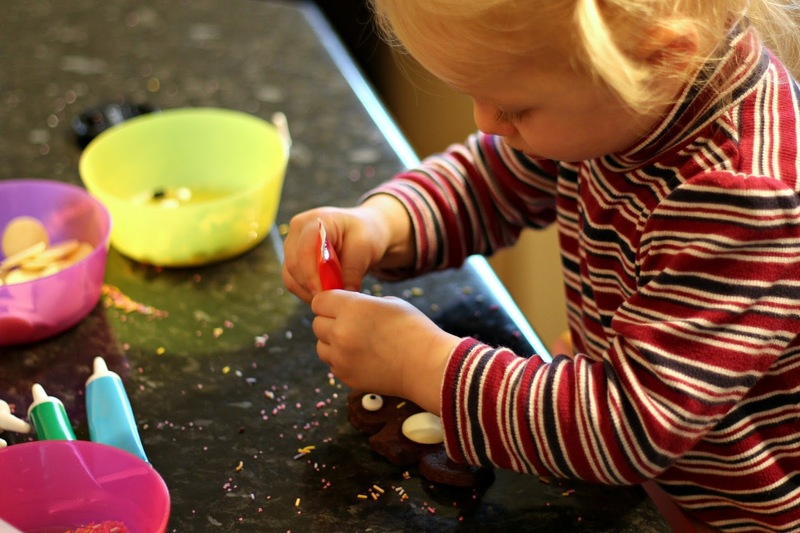 Cue a whole bunch of photos of Niamh decorating our cookies! As you can see, we had a great time making a right mess of my auntie's kitchen. Once I'd shown Niamh how to use the icing tubes, she was away and didn't need my help anymore. She decorated almost all of the biscuits I'd brought, apart from the ones that J and I did. Not only did she have loads of fun decorating these cookies, but she also enjoyed eating them too (as well as the Smarties), so if you're looking for a fun activity to do this season, this could be right up your street! Stick around for lots more Halloween fun on my blog! I've got a few more bakes planned that will be worth checking out. 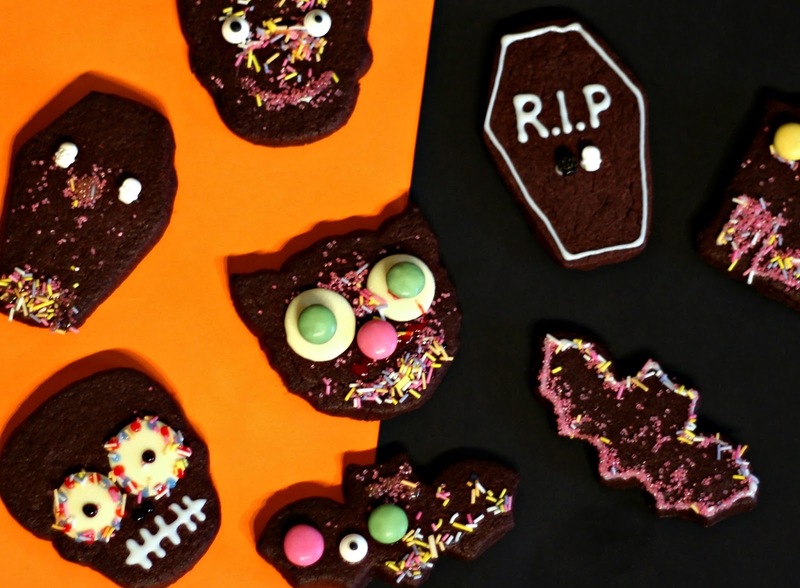 Ooooooooòooooooooo these look fun.I once tried to make Halloween scone.It failed miserably.